Mike Sullivan here again! I updated the bike rack model so now it's more or less complete. 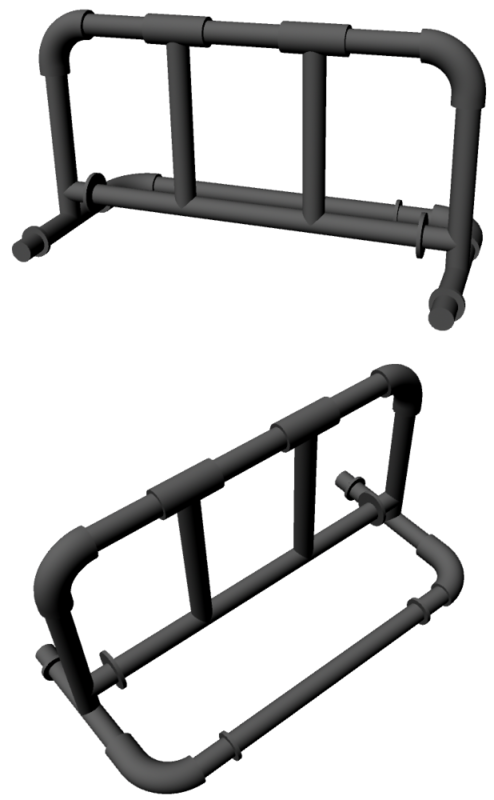 There were some other small details I wanted to add like bolts where some of the pipes are joined together, but I left those out because they should probably be textures instead of geometry, right? Hey guys! It's Val again, from the first post. First I wanna say thank you so much for your feedback and involvement. I think this is one of the greatest things ever where we students can get feedback from actual modelers in the industry. I'm more than excited to learn from the best. I've taken your advice into consideration and have modified my garage/shack model a little. I knocked down the side wall, spilled some bricks onto the ground..Into the other side of the shed, I added a table with an old, dented laptop, and a very primitive-looking makeshift bomb. Most likely, the survivor that found and modified the shed, had been working on the bomb (or part of it), using his laptop, and the screwdriver, and wrench...and maybe it accidentally went off and caused the hole in the wall. Using textures, I plan to add burnt/ashe marks onto the walls, and maybe even a little blood (perhaps the survivor wasn't so fortunate?). The dog house was made more liveable as well, with a placemat and planks on the sides of the barrell. Though one of my classmates pointed out a minor problem he found with the hole in the wall that I made. To him, it didn't look like a real hole that can appear in a brick wall. And yes, I've tried to conserve polys for the game engine. I figure, I can get the broken bricks to look real with a texture with an alpha on it, right? 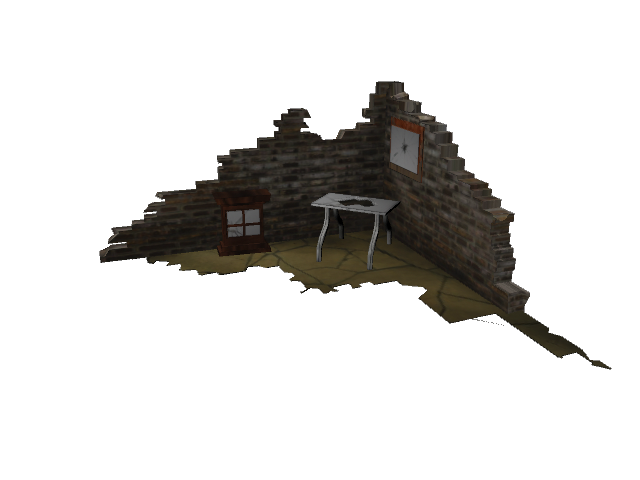 Or should I actually take the time to model out a few broken bricks in the wall? Also, just for reference, I included the starting progress of my UV process, and the wireframe of the model with the poly count. Hi I'm Nicholas Johnson. This is my first post and I am working on a blast door. So this first image is just some concept art I did of the door although I don't like the window so I think I am getting rid of that or more likely make it smaller and move it to the top door. 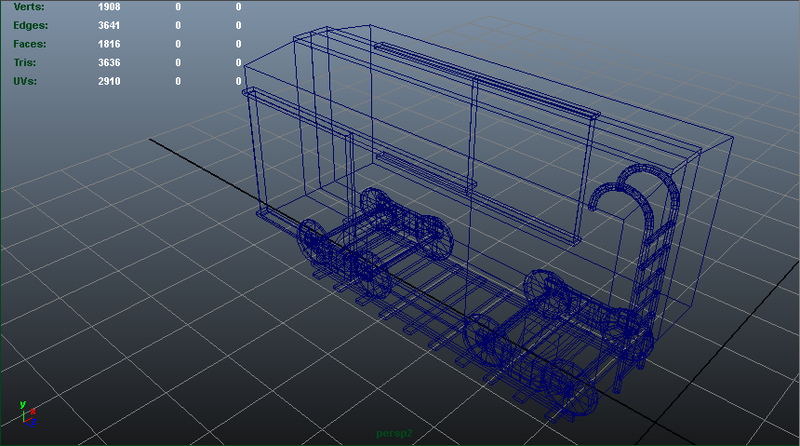 This was just a 5min model of how the shape of the door will be when I get rid of the window. Overall I like the shape much more, although does of course needs some work, shape wise. I am doing some basic texturing for while I am getting this started just to see how it looks. Last edited by Brishen on March 13th, 2013, 5:07 am, edited 4 times in total. Here is my concept for a blast door i am currently working on. I haven't finalized the texture yet, i think i will get a better idea of what i want it to look like when i complete the model with all of the details. 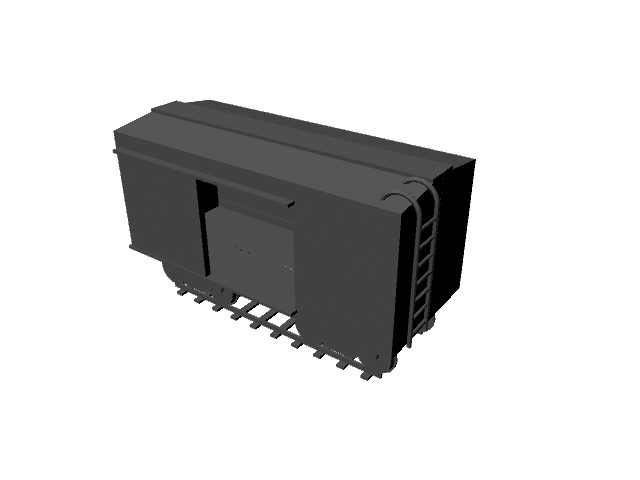 I'm almost done modeling the main body of the train, just need to do a few touch ups. Hello everyone at Wasteland 2, I'm James Wolff a student at Njit taking Eric Nersesian's class. My project is my take on a home computer in the Wasteland world. I was told technology stopped somewhere around the mid 80s, so on the right I have a big blocky 80s tv set which is meant to be the user's monitor. In front of it is a mouse and keyboard which would be styled to resemble the mouse and keyboard of the AMIGA 1000 (released 1985). Its also worth mentioning that this concept art is a little out of date, the mouse and keyboard would most likely be placed on top of the Amiga style CPU instead of a piece of timber acting as a desk. All these things are placed on top of a gas generator meant to be the power source. To the left is the computer "tower" which are several salvaged computers each based on different units from the early 80s.These are all meant to be slaves to the main computer, only there to increase it's performance and storage capacity. At the top of the tower is the head of one of your "Slicerdicer" drones which has all it legs and weapons forcibly removed rendering it harmless. It's on the top of the tower because it too has been salvaged enslaved for the purpose of better processing power. In the middle are two fans, a room fan and a desk fan, blowing air on the tower to keep it cool. Please feel free to provide any feed back you might have toward artwork or the idea itself, I don't mind changing, adding, or removing anything to make this better fit the Wasteland 2 universe. Also I'm sorry for the lack of color/detail in the concept art I do have reference images I'm planning to use for each piece of the model if you're wondering what anything is going to look like in detail. wow you clearly put a lot of thought into the story behind your project, i love the whole concept and look of it. 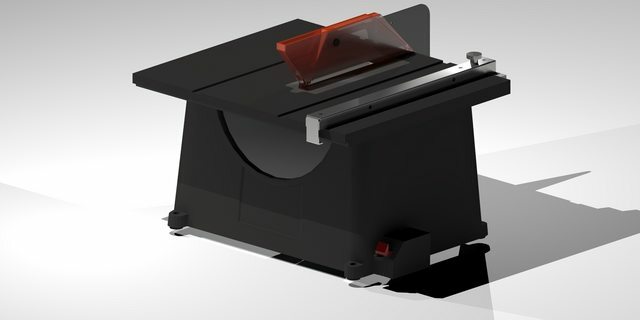 my suggestion is since the slicerdicer head has been enslaved for processing power, you might show some blast marks and a little battle damage hinting at the battle it was won in. maybe give the computer a little history too like a few faded stickers on the side and a sticky not with the password on it. Hey, its Robert again. 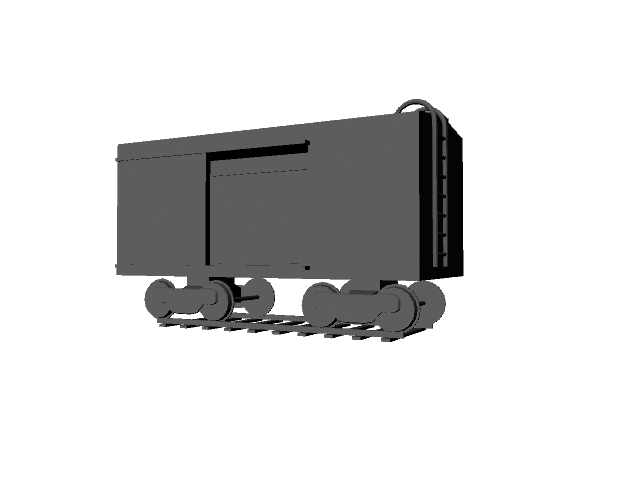 This is an update to my tanker car, I moved on from modeling and went on to UVing. I was able to uv all the objects on my tanker car and placed them on the uv space. For my uv the bottom left hand corner is the outer shipping container, the bottom right is my tank, and the top left corner is the inside of the shipping container. I made the shipping container and the tank the largest since they will be seen the most, but do you think they are the proper size to show the most details? 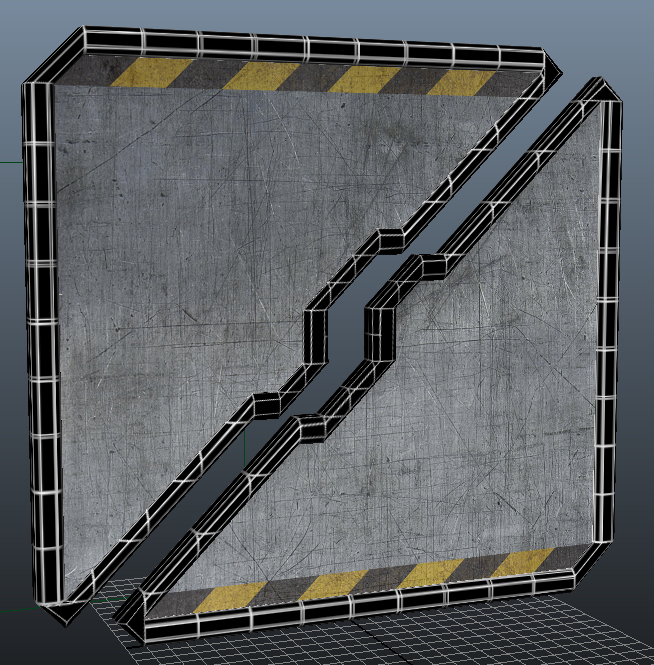 When I do move on to texturing I will be adding my AO pass as suggested before, to bring out the form of the object. Thanks for all the feedback so far! 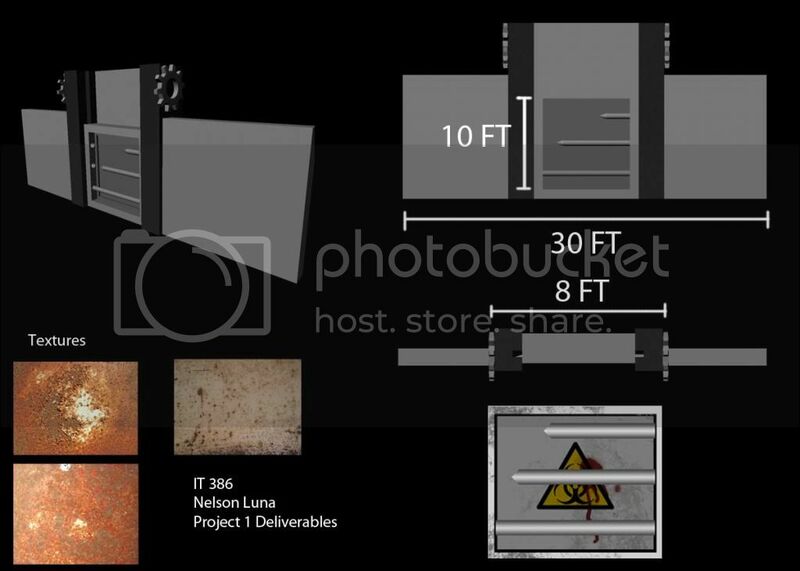 I have two projects that I did for another class and I'd like to get a feel for how interested the wasteland team would be to have these pieces converted into assets for the game as even when I made them I had wasteland in mind. and for the second asset a makeshift surgical table, thats been cobbled together from other bits and of whats been found by a wasteland doctor. Let me know what you think of the pieces and if you could see either of them coming into the game, and if so what I'd need to do to bring them up to game quality. Ok, apparently enerses wants me to post my project here to get any credit or feedback, so I shall. This bike and bike rack are my first pieces in a set following a "ruined playground" theme. Hey everyone! I'm seeing lots of great progress, very exciting stuff. I'm going to try to address all of you in this post, hard to keep up with all these posting coming in! The Door looks great, I like the concept and the idea of incorporating one of your favorite games into the design. Your geometry for your door looks solid, I would work on creating a door frame that compliments it's design, maybe put a small keypad on the door frame that the characters would interact with in order to unlock and open the door. Nice concept and nice render. I would like to see more of the details you had in your concept piece realized in the actual render mesh texture. Consider beefing up the door frame a bit, and incorporating some sort of way the player would actually interact with this door to get it open. Otherwise, good clean work, keep it up. Your concept and mesh look good so far. The door has some good thickness to it that feels very sturdy and grounded in reality. The mesh has a good level of complexity and variety of shapes. The bloody hand in the concept is something we'd like to avoid in our final versions. If this door were to be reused more than once (which is very likely will be - we rarely use one mesh only once in a game) then it would be very recognizable with details like that, because they stand out in a scene that would otherwise not have any blood in it. I would avoid putting blood splatters and other overly unique details on your final texture. You want your piece to be interesting, but not so unique that it can't really be used more than once. 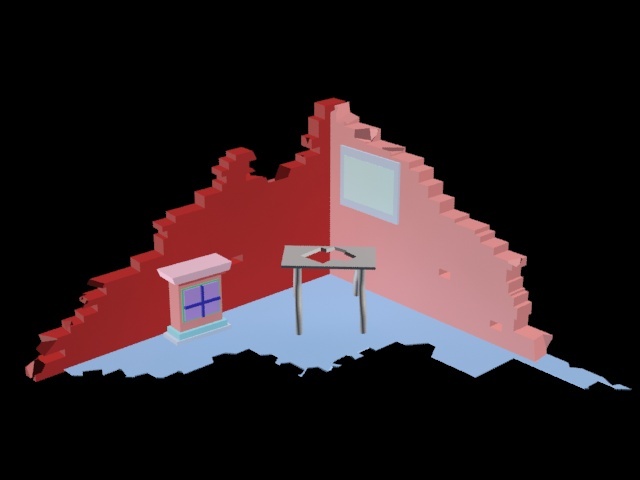 Your door concept looks interesting, I viewed your animation and it is a little slow; and I'd have the top center piece of the door retract completely into the ceiling so the NPC's heads dont clip through it. Consider having a bit of a skip/jerk in the animation, like the door is old (which it should be - nothing new has been manufactured in the wasteland for over 100 years, it is all scavenged). So maybe have it slide a little.. hold for maybe half a second, then jerk forward quickly to catch up with whatever track that it is being moved on, and speed the animation up to about 200% of it's current speed. Additionally, I would have the keypad on the door reside on the door frame, since the keypad needs to slide behind the door frame, and would likely get blocked by it. Hi Joseph! Your concept for your door and it's mesh look pretty solid. I wouldn't completely surround the door with bolts like you've shown it. Infact, I wouldn't have bolts on the door frame itself. The door needs to slide into something, or swing open, and the bolts would get in the way. Try having just 4 bolts on the corners, and welding marks showing it was welded together. The shanty shack could benefit from maybe some scrap metal wrapped around the opening of the windows, to cover the sharp edges of the metal and make it feel more polished, and have some sort of door on the front area, maybe secured on with ropes held onto the house by holes in both the home and the door, similar to a door hinge... but with ropes. Your mesh and concept is looking good! Video games have come a pretty long way, even in a game such as this where a bolt is really not too visible from our camera angle, it should be modeled in, because it will be completely unnoticeable if it is just textured on. Keep your bolts low poly, and exaggerate their size to a degree to help them read. Good concept Joseph. I like the idea, and the textural detail feels good and not too overly grungy. I think you're moving in a good direction, concept up and begin modeling a door frame for your model, doors don't just stand up on their own. Your door concept has a decent start, but structurally it has a few issues. Having a piece of glass in a blast door in general isn't a great idea - having a piece of glass that splits in two when the door opens is an even worse idea, the blast resistance of that glass is going to be very low.. and people are going to have to bend over to even look through it. Put the window in one upper 2/3rds in one of the doors, and have it be at the players eye-level. Take the blood and giant gouges out of the center areas of the door. I've said in many posts that blood is something that just generally looks bad on props. Unless people are being executed in front of this door, threes really no reason why there would be blood all over it. It also very much hurts the re-usability of the door, we want pieces to be interesting, but not overly unique so if you see it a second time you know exactly where you saw it before. Try and think logically how and where damage would occur on a door like this. Paint would chip off on the edges and rust would accumulate around the outer edges, long gouges that look like someone slashed the door with a light saber doesn't really make sense. Have small blast marks here and there, and maybe a few bullet dings (but not bullet holes - bullets shouldn't be able to penetrate a blast door, it defeats the purpose of the door. It should have dings in it, but not serious damage that affects the integrity of the door. Keep posting! Nice concept! Well thought out and looks sound structurally, the big beefy handle fits the door really well. Hinges are fine, there is nothing wrong with hinged doors. It looks good so far, so keep it up. Hi Valeriya! Good work with the model. I'd like to see the inside of the little dog house actually hollowed out, and have the dog bowl dip in, etc. You're geometry is very simple - don't get me wrong, this is in no way a bad thing, sometimes students will go overboard with geometry complexity, and it can get very messy very fast. For the brick wall, I wouldn't use alpha's in a situation like this. 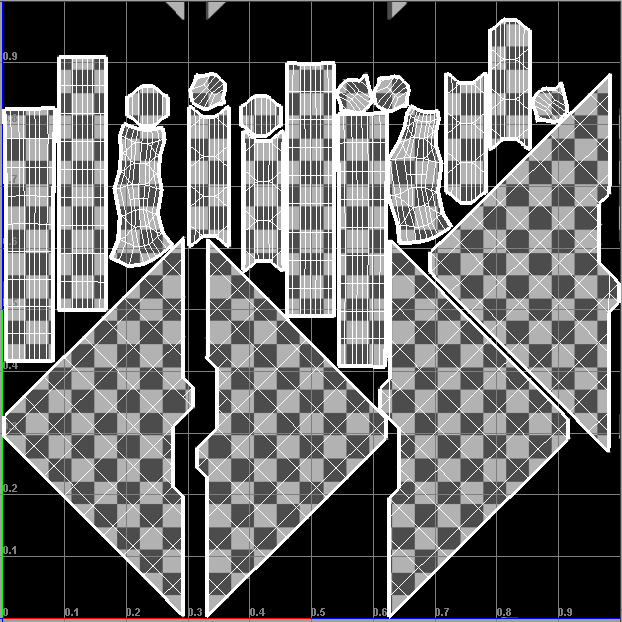 An alpha on geometry like this would look very odd - you would be able to see down inside the mesh, since your wall isn't just a flat plane. What I would recommend doing is grabbing some of those bricks on the ground and duplicating them and rotating them up into the wall and just sort of nest them in there. It would really help sell the wall's damage. 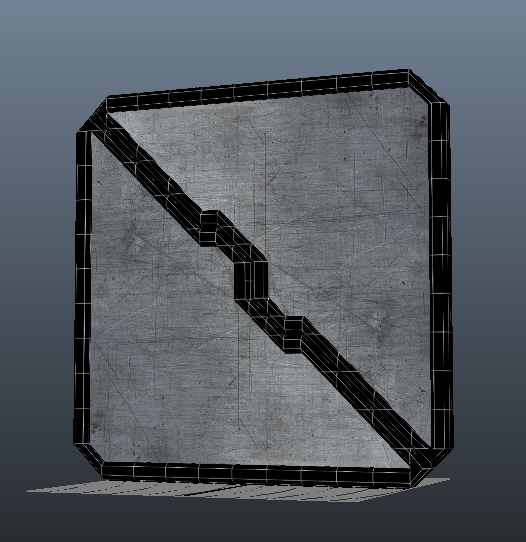 Consider modeling some chips into the bricks, have a big chunk taken out of a corner, or a nick in the bottom. I modeled something super quick to demonstrate what I mean. Physically modeled details used to supplement textural details can be very effective. Also consider doing the same to the edges and corners of your other models and building to help add some interest to your geometry. Hi Nicholas! Your model and unwrap look good! Well within our polygon limits and clean. 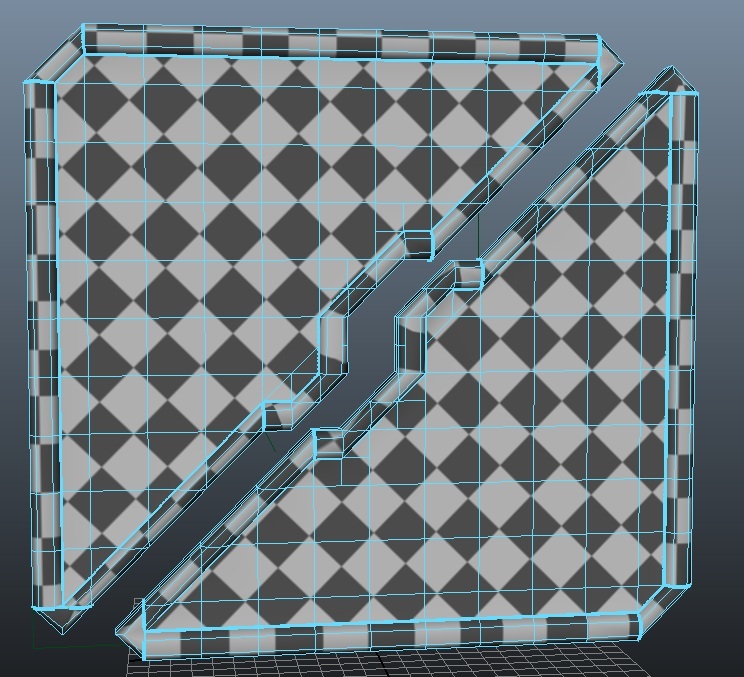 Model a door frame to go along with the rest of your mesh, so it just isn't floating there in the game. Otherwise it looks good, keep going! Your door/concept looks good so far. 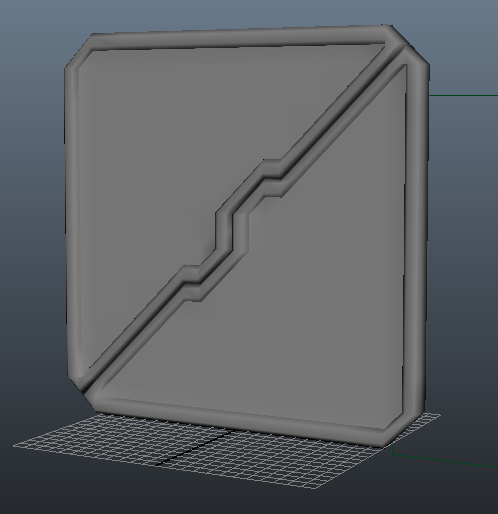 Beef up the door frame and maybe add some sort of beveled edge or some sort of details to add interest to the mesh. I'd also consider moving the keypad to the frame of the door, though it looks as if it might work on this design. Just make sure the frame is thick enough so the keypad does not clip through the wall/frame when it slides in. Looking good so far! Post some wireframes so I can take a look at your topology. 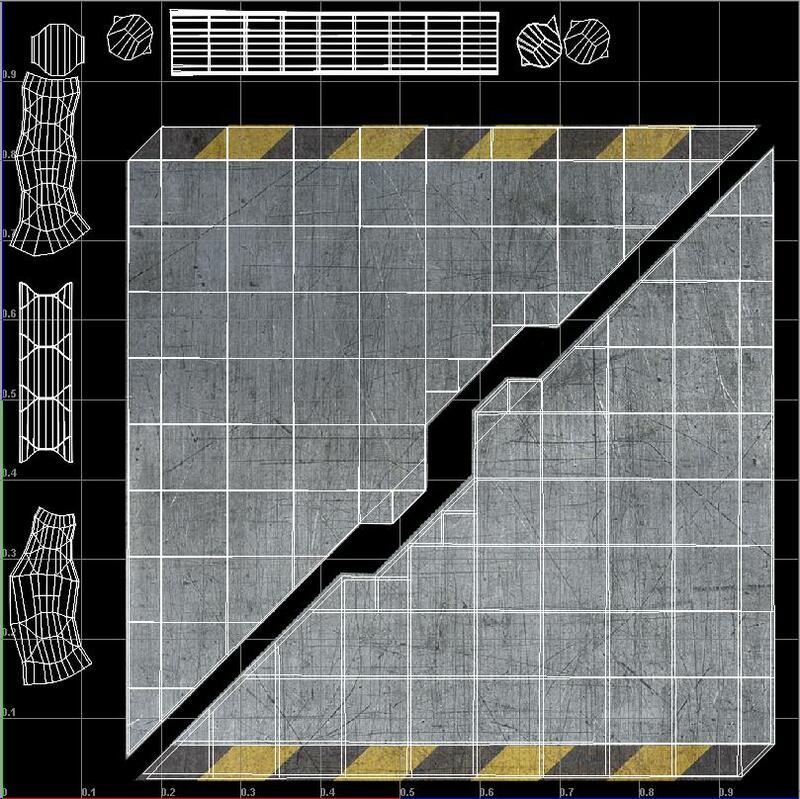 From a glance, it looks like some of your geometry may have too many edgeloops for our target triangle count in wasteland. Nice, solid clean concept James! I really look forward to seeing more, I like what I see in the concept. Hi Robert! Your UV's look pretty good and from looking quickly at the concept your texel density seems to be pretty consistent. You don't have much wasted UV space so good job, keep it up! Hi Daniel! Your geomety looks clean, and very smooth.. almost too smooth. Judging from how smooth most of it is, it's probably way outside of our triangle count range. If you could post some wireframes and triangle counts, that'd be helpful in providing feedback. 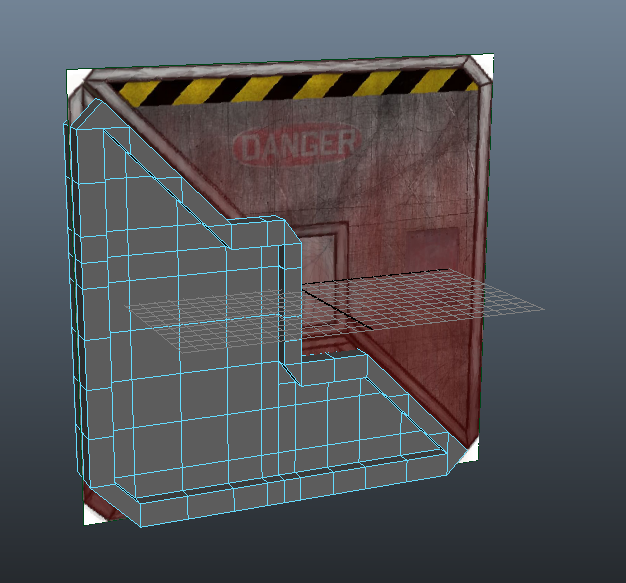 They are also way too clean for the wasteland, ding up the meshes, add some defects/cracks, and some textural grunge. 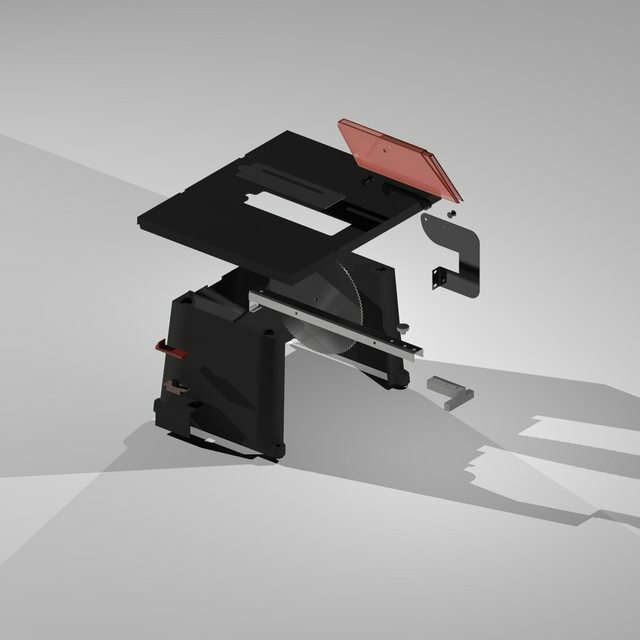 Additionally, your surgical table doesn't really look like a table in any way. It looks like some sort of strange torture device or wood working table that the legs broke off of. Add some area where the patient would actually lay down, a head rest.. some sort of padded bed or stretcher like area. Hello Surreal Canine. Your bike rack geometry has a decent start to it, but it presently isn't reading very well, a lot of the essential parts that makes a bike look like a bike are missing, so at a glance it just reads as a bunch of pieces of metal, not a bike. Model in the spokes and have the chain maybe hanging off of the pedals, and model some handle bars and a seat. While yes, typically stuff like this would have been scavenged in the wasteland, there needs to be some sort of identifiable pieces of the geometry left so you know that what you're looking at is a bike and a bike rack. Good work so far everyone, keep it up and keep posting! 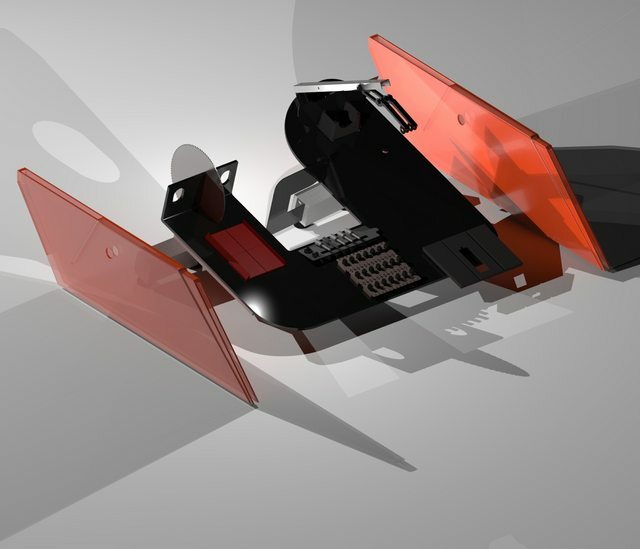 Here is an updated render of my blast doors. I added decals to the door itself after UV unwrapping them. However, I'm not too happy about how the light metal material on the doors turned out so I will be fixing that. I've also taken advice from here on the forums and made the frame thicker as well as added a keypad on the right side for the user to interact with. I'm also thinking of adding bolts to the door frame to make it look more industrialized. The concept art I was using for a number said <10,000 but that seemed a bit high. If it needs to be lower that that just give me a number to aim for and I'll get it to work. dlh2468 wrote: and for the second asset a makeshift surgical table, thats been cobbled together from other bits and of whats been found by a wasteland doctor. your "surgical table" is just a bunch of re-sized pieces of your table saw, you didn't even change the colors or the textures. If you did make the table saw then i know you can do better. 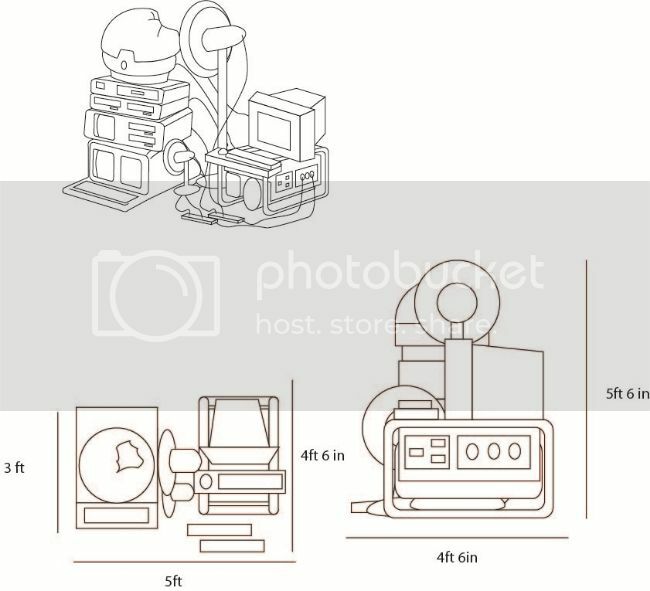 if you want to make a surgical table, try using a photo reference then imagine what decades of wear and makeshift repairs might look like. I wanted to really give the door a sense of sturdiness, which is why I used horizontal stakes as a mechanism to lock the door in place. It is supposed to slide vertically, with the use of two cranks/wheels on the side to pull it up. The dimensions are probably off, but an alternative use to this that I have thought of would be to use it as a flood gate of sorts, so my measurements were more based off of that concept. 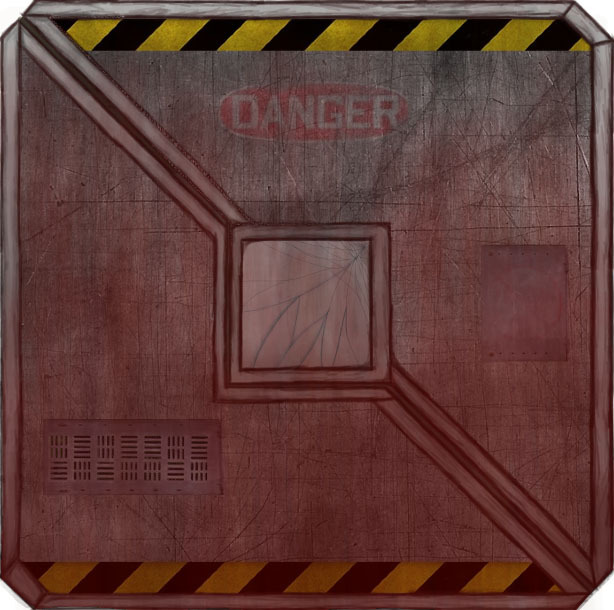 I've been seeing the use of the biohazard warning signs on the blast doors and other props. This is not a typical sign used on blast doors, and doesn't match with a game whose focus is placed on nuclear armegedon. Kalayo wrote: I'm also thinking of adding bolts to the door frame to make it look more industrialized. Eh. It's a sliding blast door. I don't think bolts are really necessary. They'd just look sort of superfluous. Bolted on, if you will. Hi everyone, just wanted to post an update for my class' progress. This week is our spring break, so there will be little activity on our end for the week. I hope to have our first round of completed assets up in the unity store during the first few days of April. Then my students will start another asset from the concept phase and we will cycle through the whole production process again to reinforce what they learned. That second batch of assets should be in the unity store in mid May. Those students whose first asset isn't up to par to submit at the beginning of April will have the option to continue working on that asset until the end of class or start on a new one. I would like to thank everyone who has taken the time and provided feedback to my students. Its been such a huge eye-opening experience for us all. I can talk to them about how real production works until I'm blue in the face, but it doesn't compare to having real interaction and feedback from artists in a live production environment. It's also very important for them to get comfortable with exposing themselves and their work to others. Being actively involved in the communication and feedback flows in a production pipeline is an invaluable experience that very few undergrad students or programs can claim. So I've been working on my dilapidated corner to make it look better. Here is what I have done since I last posted here. I will be applying textures soon. Am I headed in the right direction and what can I do to make it look even better? And here is my render with added textures.